Who doesn’t dream of a walk-in wardrobe for organising their clothes, shoes and other accessories, so that they are always close at hand? While size is somewhat important, fitting a walk-in wardrobe can sometimes be a bit of a puzzle if you do not ask yourself the right questions. Whatever you envisage, you first need to quantify your needs and estimate the costs for designing the most appropriate walk-in wardrobe storage space. When evaluating your needs, it is crucial that you have a thorough sort through your clothes. After all, there is little point keeping items that you will probably never wear again but are attached to emotionally. A walk-in wardrobe will provide a home for all your possessions if you make the most of every single square centimetre. Even if you don’t need a specific room for storing clothes, you will need at least 4 m2, taking into account the area required for moving through the space and storage pillars that are 80 cm deep. Furthermore, if you also wish to dress in the same area, you need to allow for a central area measuring 1 x 1.20 m.
Based on an area measuring 4 m2, there are a range of possible solutions. Modular and/or ready-made walk-in wardrobes are a cost-effective solution. Some kits are either height- or width-adjustable, meaning they can be adapted to the length of your wall. Storage solutions delivered in kit form come with accessories that allow you to design individual layouts that meet your needs perfectly. In general, fronts are optional. Once you have evaluated the volume needed for your clothes, grab a calculator to add up the elements that form a modular model or a tape measure to identify the different options afforded by a ready-made walk-in wardrobe (height-adjustable shelves are indispensable). 3 . What’s your budget? Based on the chosen solutions, the price of a walk-in wardrobe can vary enormously. Countless kit-based models are priced from €60 to €300. Allow for €200-400 per linear metre and budget between €400 and €1000 for a complete storage solution. This price range will provide you with models of standard dimensions: 60/80/100 cm long. With a budget of around €3000, you can design solutions for a small room measuring approximately 4 m2. With open storage solutions, i.e. without fronts or featuring sliding shelves, chests and drawers. Starting at €5000, you can choose from a range of made-to-measure units that provide the most appropriate storage solutions for each item of clothing. While this is the best solution, the price can escalate very quickly. 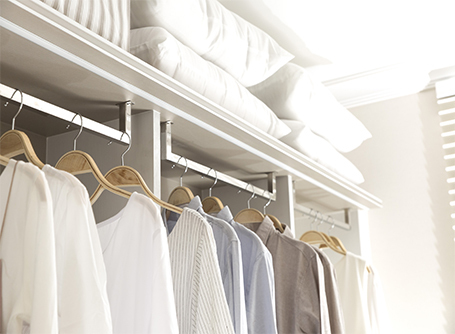 The first step in the process is to evaluate what the walk-in wardrobe will store and to define the storage method: on coat hangers, on shelves, in drawers, etc. In fact, the layout must match your precise needs: tall spaces for dresses and coats, medium-height spaces for jackets and low spaces for shirts and trousers. Drawers can be home to underwear, socks and accessories. Boxes, jumpers and t-shirts can be stored on shelves. – A width of 1 m allows you to hang six coats, twenty pairs of trousers or twelve dresses, seven to ten shirts, five to six jackets, twenty skirts. > Ask the right questions: how will the walk-in wardrobe be used? Who will use it? How many drawers, shelves, coat hangers do I need? Do I need space to store shoes? > Carefully identify the location of this space designed for storing clothes. Where will it be located? In a small room? In a master suite? In the corner of a bedroom? > Carefully identify the budget you can set aside. This will help you choose your model. 10 ideas to design the perfect walk in wardrobe!